This walk begins at the end of Stuart Road in McLeod Bay and follows the coastline along a Department of Conservation (DOC) reserve. 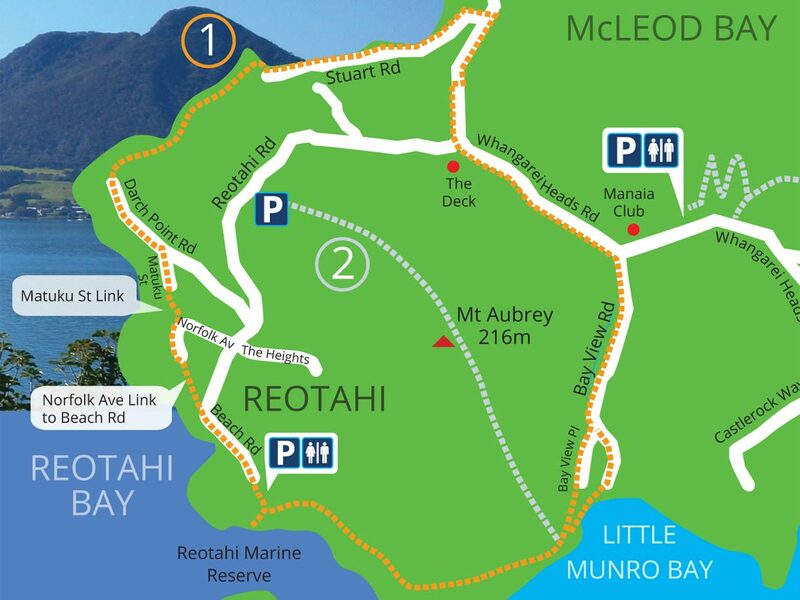 Once you reach Darch Point Rd you have two options; One option is to walk to the end of Darch Point Rd and turn left onto Reotahi Rd which will take you back to Whangarei Heads Rd. The other option is to follow the Matuku St Link and Norfolk Avenue Link to Beach Rd to join up with the Reotahi Coastal walkway. This combines the two walks to form a longer coastal track passing by the Reotahi Marine Reserve and then the historic remains of the Meat Freezing Works with views to Marsden Point. The walkway continues towards Little Munro Bay where you follow Bay View Rd up the hill until it meets Whangarei Heads Road. Turn left and follow the footpath back to where you started.